Weapon Theme Address Plaque - - 16" x 11.75" custom address sign for your home or business. Features a gun logo above the address or establishment name. Weapon assortment includes a derringer, a flint lock, revolvers, semi-automatic pistols, and AR15 & AK47 style rifles. This wall mount arch sign holds one or two lines of personalization and the weapon you select. A one-line street address sign holds up to four (4) 3.5" characters or six (6) 3" characters. A two-line sign holds up to four (4) 3.5" or five (5) 3" characters on Line 1 and up to twelve (12) 1.5" characters on Line 2. If you are ordering a one-line sign, please leave th Line 2 input box empty. Dimensions (approximate): 16"W x 11.75"H x 1/8". Click top link in Related Products to purchase a smaller 12" x 9" version of this sign. 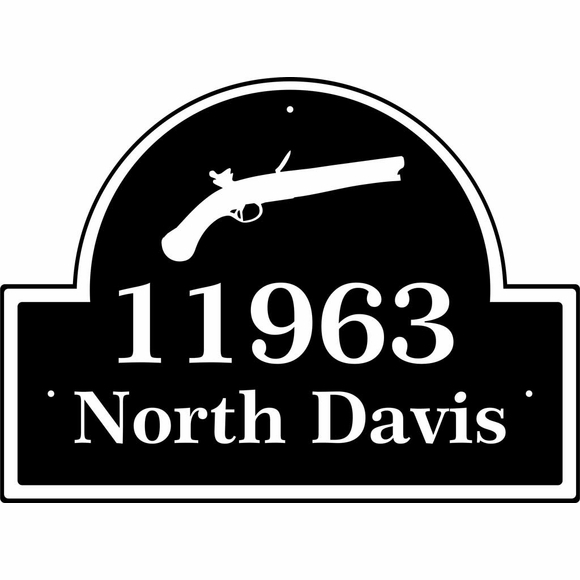 Personalized Rifle or Pistol Address Plaque for gun collectors, hunters, military families, and weapon enthusiasts.